The summer is upon us again, time for all of your American Legion, VFW, VVA and other veteran organization fundraising cookouts, clam bakes, festivals and just good ol’ fun outdoors. These events always have great turnouts with veterans and their family members and friends arriving from near and far to help the cause and enjoy a nice day with the Vets, and maybe win a prize too! Sure, that gift certificate is nice and the spa day is something your wife will enjoy, but this book fits great into the theme of veteran inspired events. put in the work to make the memorial happen, the best time to visit and interesting facts and stories about these sacred locations. The truth is many Vietnam Veterans would love to go to the memorials in their states but cannot due to time, health, distance or financial reasons. So this book brings the memorials to them. We at Fallen Never Forgotten give a special rate for Veterans Organizations when they buy a box of ten books. The normal price is $39.85 for an author signed, special edition book, but when you buy a box of ten you get it for just 27.95 per copy! Many veterans organizations across the country have brought up the idea at their monthly meetings and are already using these books for fundraising ideas and also donate a few copies to local schools and libraries in the area to help raise awareness of these important locations. 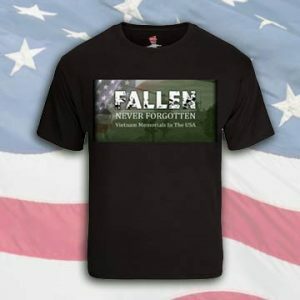 You can order a box of 10 copies of Fallen Never Forgotten below or click here to order just one copy at the normal price.